I went grocery shopping yesterday and again I went crazy with fish and seafood. I have always thought I knew what red snapper was in French…in my mind I had no doubt it was “rougets” because of the red connotation (rouge = red) and rougets are red and very trendy nowadays in France, they’re served in many new and hype restaurants. Snapper looked a lot bigger but I though, oh well, anything American is bigger anyway. Yesterday I could feel I was wrong for all those years and when looking closely at the fish, I started having doubts. You might think, ok what’s the big deal, if she doesn’t know the translation. The thing is that I like to know what I eat and find out more about the fish and what it’s called in my mother tongue, wouldn’t you? Some people might think I am weird, and maybe I am. For a while I was just staring at the fish and could not make up my mind if I was going to buy it or not. I was somehow worried that snapper would be perche du Nil which I refuse to eat. It’s been exported in France from countries like Kenya, and other African countries and it’s one of the most invasive specie you can find; it destroys every other specie around and is somehow like a parasite. Since its introduction in some African lakes, the other species that lived there, are all extinct and it created many environmental issues in those regions. I am not sure if perche du Nil is grown or sold in the US, and would hope not. After searching all over the place, I was releaved that Snapper is not perche du Nil, but it’s called Vivaneau. Honestly I have never heard that name before yesterday. Don’t you think it’s such a cute name? sounds like the name of a kid with rosy cheeks from the 18 th century, “hello, my name is Vivaneau, nice to meet you”. First I could not believe a fish would be called Vivaneau, then I had to come to the conclusion that it was its proper name, even though there are a lot of different species in that category. Anyway, that mysterious snapper ended up in a skewer and I was glad I learnt Vivaneau is living among many in the ocean. Snapper tends to have a fragile texture, so if you overcook it, it will break. 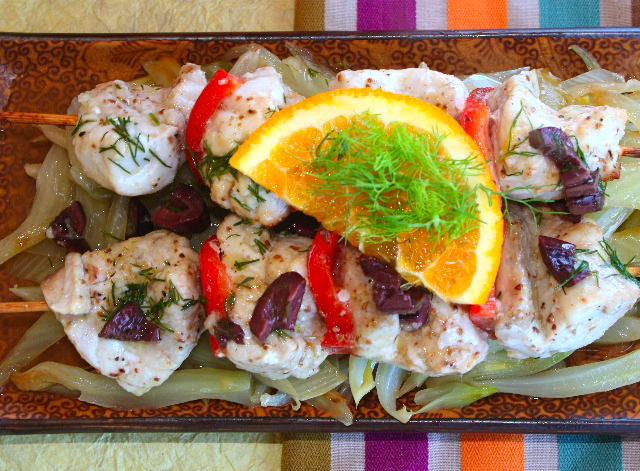 Fennel, orange and white fish are some of my favorite ingredients, they blend beautifully together. This dish is so simple and quick but still delicious and flavorful, let’s not forget healthy. In a mixing container mix snapper pieces with marinade ingredients, place in the refrigerator and marinate for about 2 hours. In a pan, add olive oil and brown onions. Add fennel and cook at low heat until the fennel is tender, almost melting. Add salt and pepper. Prepare vinaigrette, by mixing all ingredients together. Start making kebabs using bamboo skewers, (previously soaked in water to prevent them from burning). Alternate a piece of fish with a piece of bell pepper. Sprinkle with Szechuan pepper and salt and broil under broiler. Do not over cook, fish is very tender and might break. Serve with fennel fondue and kebabs on top. Drizzle with orange-olive vinaigrette. This entry was posted by silvia on October 9, 2009 at 10:11 pm, and is filed under Fish/Seafood. Follow any responses to this post through RSS 2.0.You can leave a response or trackback from your own site. wow…that looks so awesome…..mmmm. I hv just had monkfish satays this week at a Thai Restaurant. It was sooooo gooood! Yours look very good too. I would love to try it. I love the seasonings and the presentation. I love this fish we have plenty here in France !!! thanks for the sharing ! if you like pistache come and see my blog a dessert with a bonbon is waiting for u !! Fennel fondue — what a great idea. I just started fennel in the garden. Can’t wait to try this in the spring. You are too funny! I love reading about your thought process for finding out the name for red snapper in French and, indeed, it is a lovely name. This recipe is another to put on my list to try. The dish is beautiful, and I love all the flavors you used. je n’ai jamais entendu ce nom de poisson…vivaneau? les rougets je connais bien mais les vivaneaux vraiment pas! 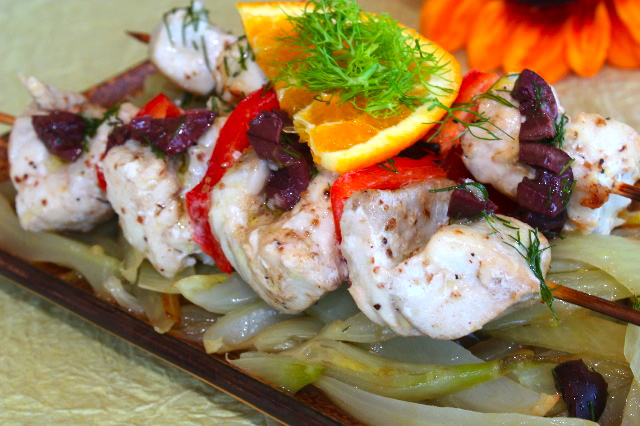 i have some fresh fennel,it’s a wonderful recipe,you tented me!and i have a lot of awards for you on my blog,because i apprecieted your posts much,much,much! Kebab is way down under my cooking list, not yet try it but would love to try it some of these days. Your kebab looks great and I’m still planning what to put together in my kabab. Maybe should try your version! Thanks. This is such a gorgeous dish. I would love it if you would submit the recipe to our December’s BATTLE FENNEL and participate in the fun!